Three-dimensional imaging from a Cone beam Computer Tomography (CBCT) Scan present many advantages to placing dental implants. The dental implant itself is a titanium cylinder that is placed into bone and behaves as a root analog for a crown and bridge restorations or as an anchor for a removable denture. Like all metals, the surface of the implant has an oxide layer. Titanium oxide is osteo-conductive, which means bone cells are attracted to it and grow into the surface on a microscopic level. This process is called osseointegration and it takes approximately 12 weeks to achieve. 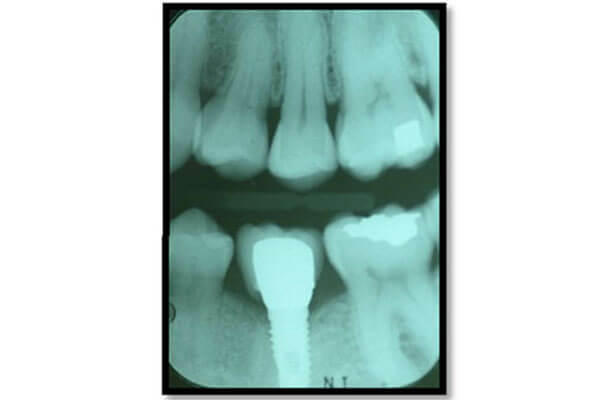 Once, integrated into bone, the implant can receive its dental restoration. 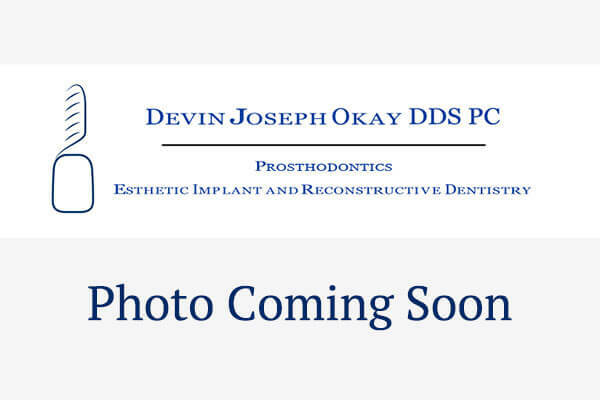 There are some circumstances if the implant stability is high at the time of surgery that a temporary crown or bridge can be placed. This is considered an immediate restoration. The benefits of placing this type of restoration should outweigh the risk and needs to be reviewed with the patient prior to treatment. 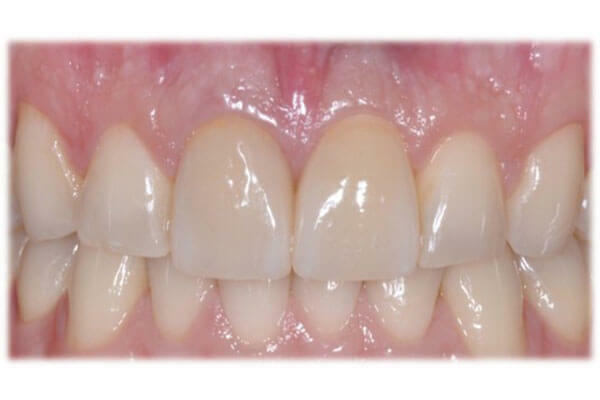 A single implant with ceramic crown restoration is a treatment alternative that spares adjacent tooth reduction for a bridge. 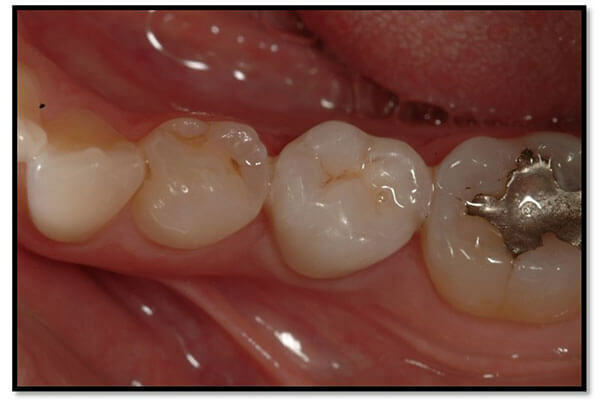 The surrounding periodontium in between the implant crown and teeth provide the ceramic contour “emergence” from the gingival margin and its natural appearance. 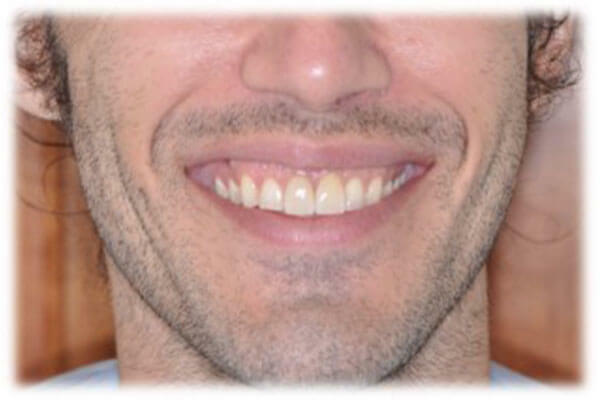 A single tooth implant is a viable alternative to a “bridge restoration”. 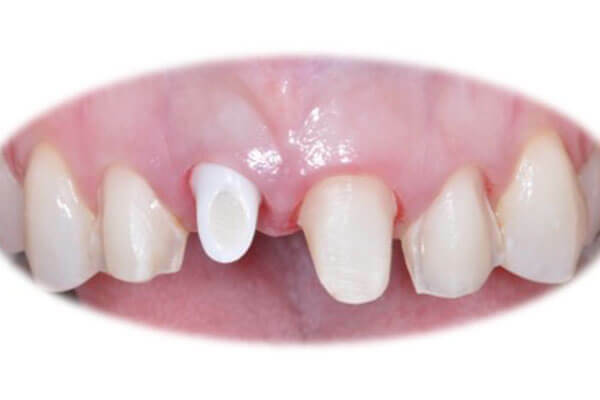 One option for single tooth replacement is an all-ceramic bridge. 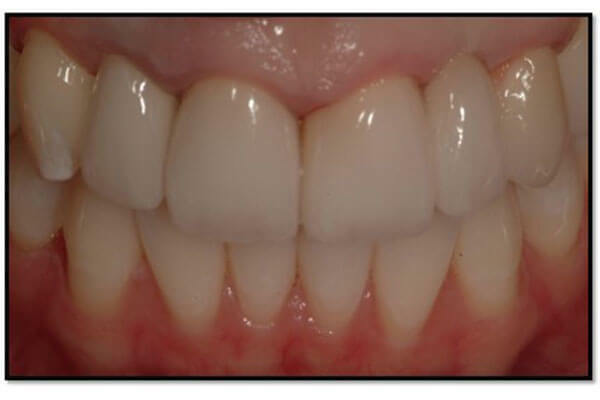 On-site neccesary to achieve superior and predictable esthetic results. 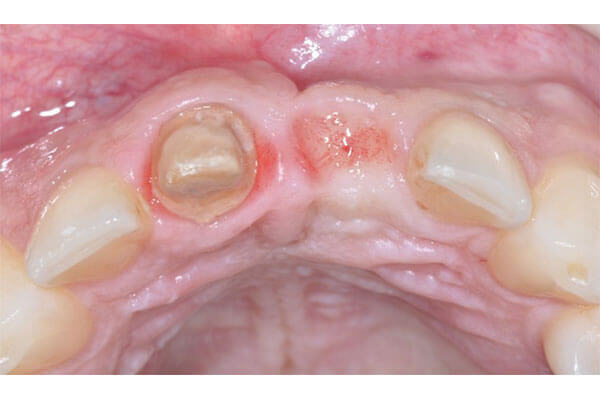 This patient presented with a large cyst on the left central incisor. 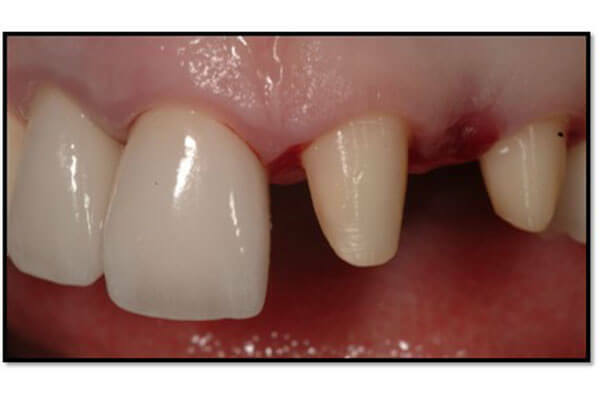 This tooth was unrestorable, extratced, and the site was prepared with a bone graft procedure. 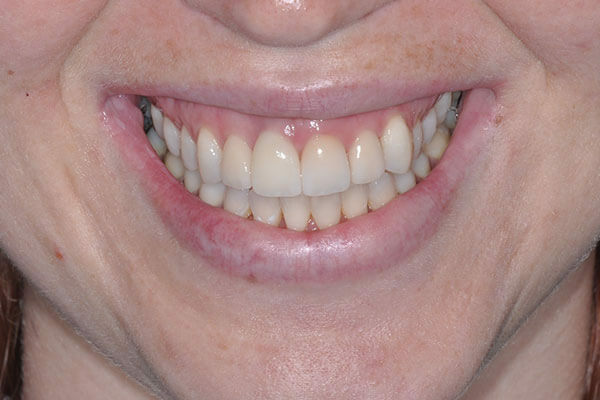 This patient suffered trauma to her anterior teeth. 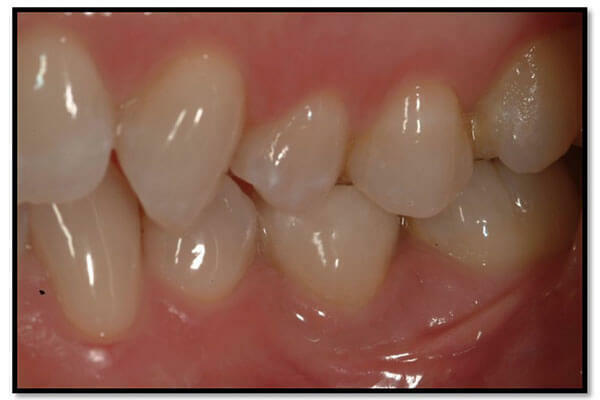 the right central incisor was lost and replaced with an implant for restoration. 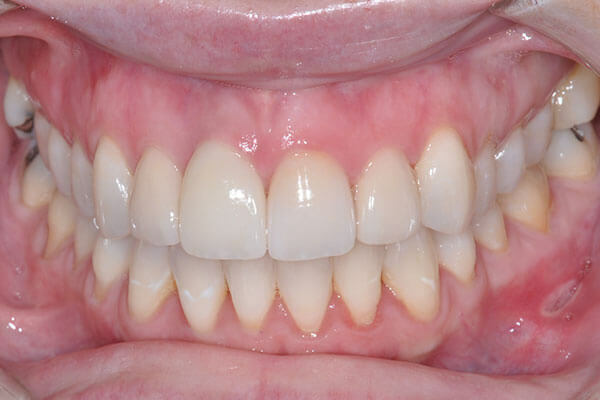 Invisalign removable orthodontic aligners were used to correct lower “crowding” of teeth before definitive ceramic restorations were completed in the upper arch. 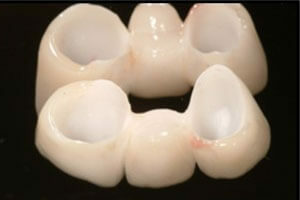 The teeth are prepared for high strength ceramic veneers and crowns. A computer aided design (CAD) ceramic abutment is screwed into the implant for esthetic purposes before cementation of definitive restorations. A CBCT scan of the jaws can be registered into dedicated software for planning dental implants. This allows for the 3D visualization of anatomic structures for safety purposes. The nasal cavity and sinus are clearly outlined such that available bone is measured for the specific length and diameter of the implants in the upper jaw. 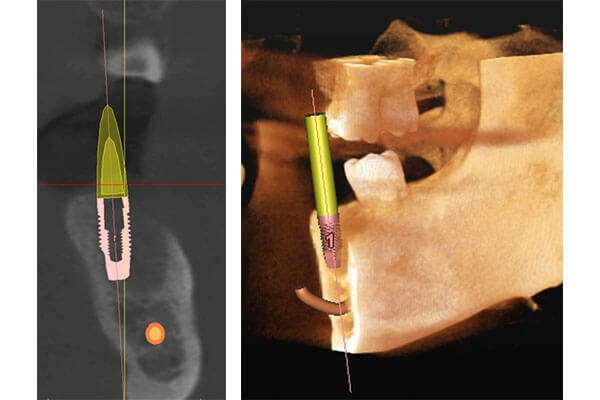 In the lower jaw, the mandibular nerve is respected such that implants can be virtually placed prior to surgery in ideal positions and angulation to the surrounding bone and dentition. 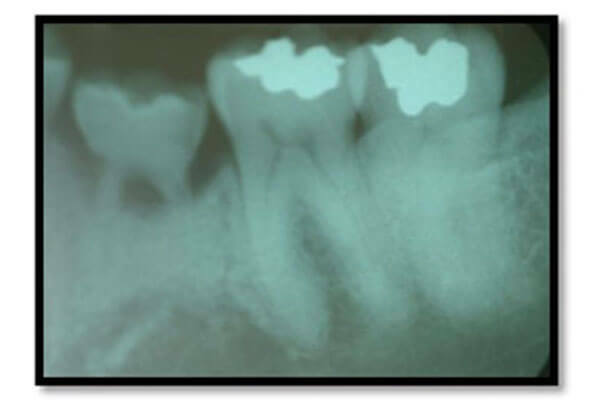 A scan can also be made of the dental arch and it can be registered into the software program. This additional digital information can allow the fabrication of a computer aided design and computer aided manufactured (CAD-CAM) surgical guide. 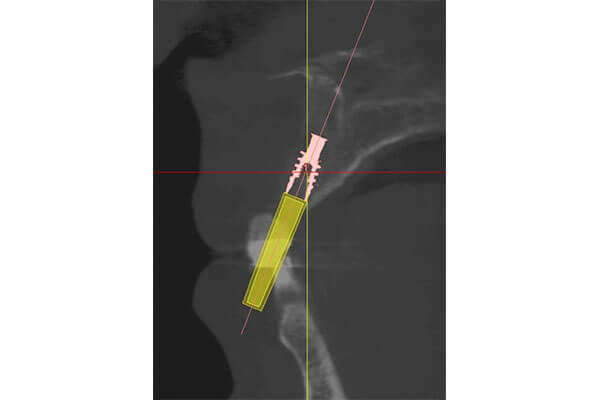 The surgical guide reproduces the number, position and angulation of implants with high accuracy. This approach to implant surgery is minimally invasive and lends to less post operative pain and swelling. This is primarily due to maintaining the soft tissue on bone. Little to no bleeding also lends itself to a “clean field” where restorations can be placed at the time of surgery or the immediate setting.